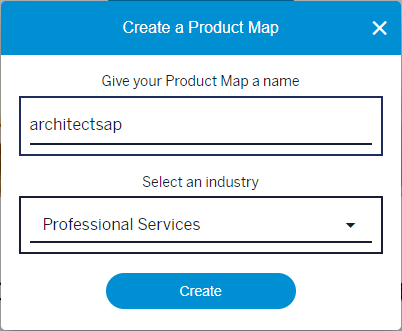 Create your own product map in the SAP Transformation Navigator in less than 30 minutes! So you have 30 minutes and want to learn something new. How about creating a personalized product map for your company? The purpose of this article is to give quick, easy-to-follow instructions on how to use the SAP Transformation Navigator. Ready? Then let’s create our own product map. First, I log into the SAP Transformation Navigator. You can quickly login using your S-User ID. On the landing page, I start the creation of a new product map by clicking ‘Create Product Map’. I then type in a name for my product map and select my industry. The next step is to select products I am currently using. An easy way is to click ‘From customer profile’. 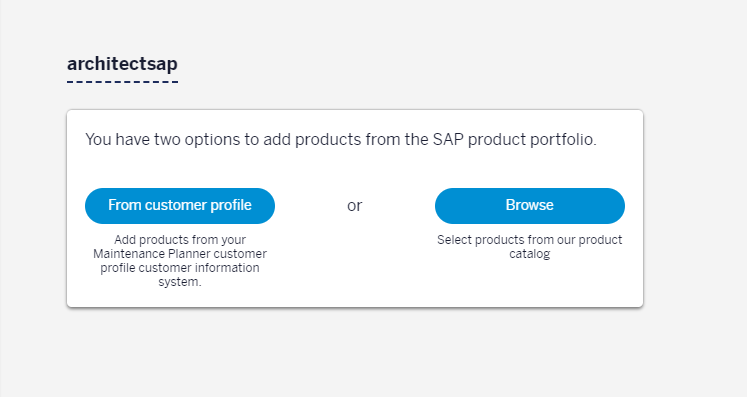 Your customer profile is linked to SAP Solution Manager, so all your products in the SAP Solution Manager will automatically show up in the SAP Transformation Navigator. Alternatively, you can select products from the list by clicking ‘Browse’. 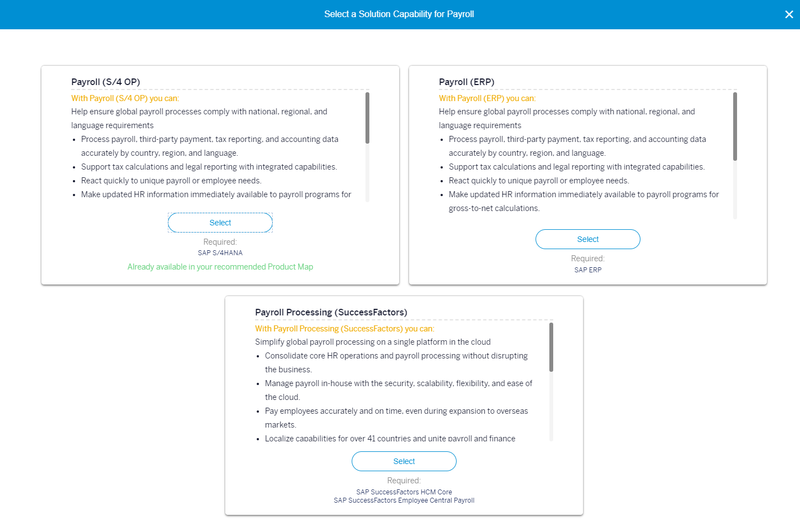 Now, I see the overview of my system and want to select three products: SAP ERP, SAP S/4HANA Finance, and SAP S/4HANA. On the left-hand side of the Product Map screen, I can now see the selected products. What are my recommended products? Since I am already using SAP S/4HANA, no decision is required here. However, there are “Open Decisions’ for the other two products. There may be several recommended products depending on my value aspirations. That’s why the tool needs additional information from me. 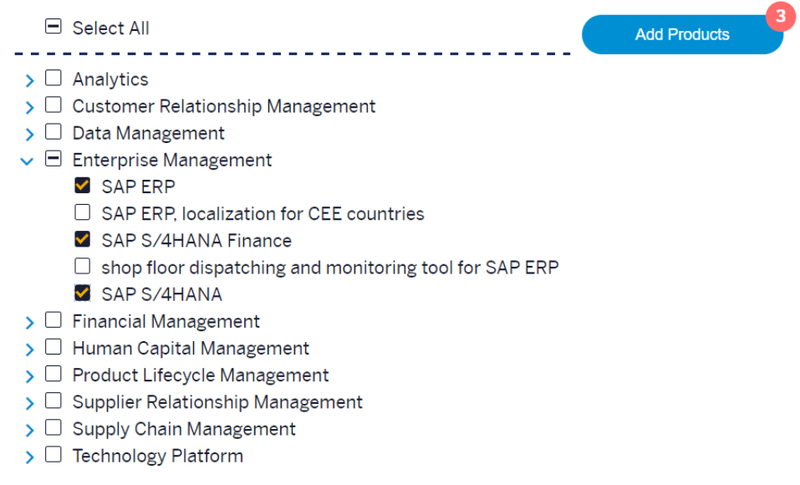 I first click on the “Open Decision” button for SAP S/4HANA Finance. I am prompted to select my preference for either on-premise or public cloud product. I chose public cloud. Now, I need to make a decision regarding SAP ERP. To give the best recommendation, the tool requires additional details from me. So, in the “Decision-Point-Tree”, I need to select capabilities I am currently using. 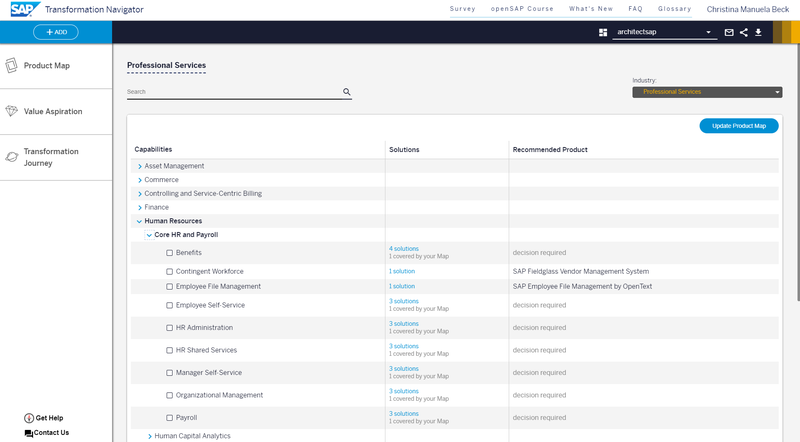 I select Lines of Business >> Solution Areas >> capabilities, as shown in the screenshot. When I return to the Product Map screen, I can see that the red ‘Open Decision’ icon has turned blue. It now shows the number of capabilities I have selected. By clicking on the blue icon, I open a capabilities overview table. I can see the needed products to attain the selected capabilities. What if I want to have more capabilities in the future? For example, I want a product for Core HR and Payroll, so I click Add >> New Capability button. The tool then allows me to see which products support this capability. The SAP Transformation Navigator gives me three option – I choose SAP SuccessFactors. Once again, I return to the Product Map screen and click on ‘Products’ >> ‘Consolidated’ view. On the left, I can see my current products. On the right – the recommended products that would fulfill my recently selected capability. I now move to the Value Aspiration screen to get an overview of the business value that this transformation can provide. I can also select value drivers I aspire to improve. The selected value drivers will help me build a business case for my transformation journey. Therefore, I select the value drivers that are most important to me. For example, I want to decrease my HR costs per employee, my finance costs, and reduce days in inventory. I can now ‘Go and Set Aspiration’ for each value driver.The aspiration range of a value driver describes the upper and lower boundaries for improvements that have been achieved by SAP customers using SAP software. I set the range to low, medium, or high depending on how important the value driver is to me. Once I am done, I click on the Transformation Journey screen. Here, I can assign priorities depending on which product is more important to me. Priorities are important, because products are ‘competing’ for resources. 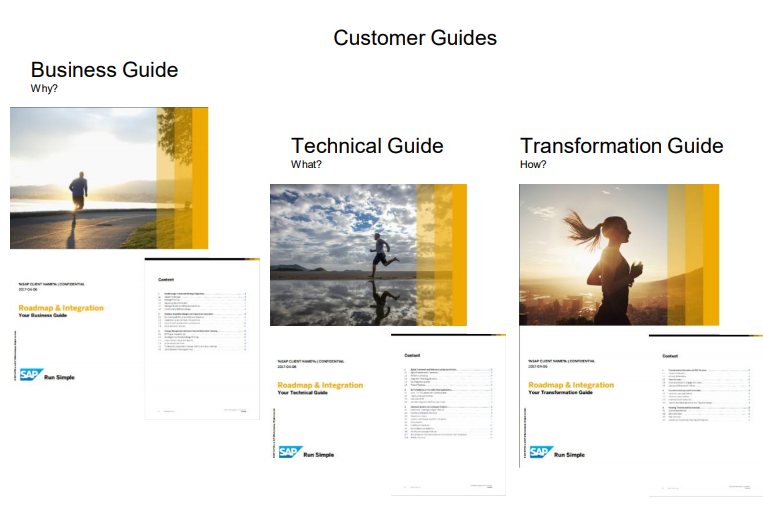 This was just a quick guide on how to use the SAP Transformation Navigator. There are many more features to discover! 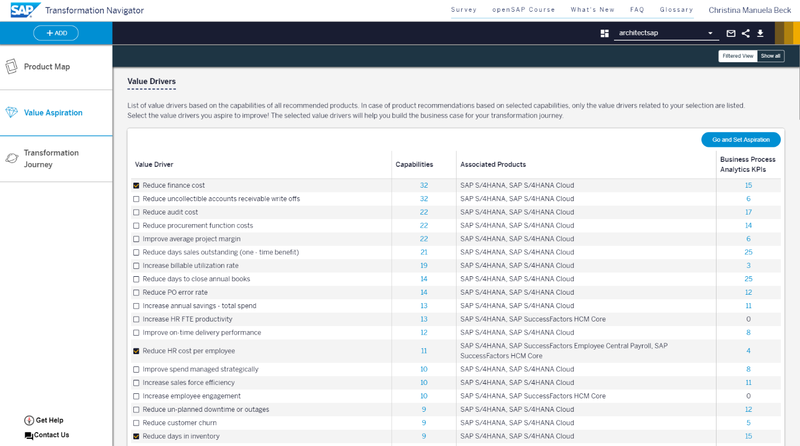 If you have an S-User ID, create your own product map at www.sap.com/transformationnavigator. If not, you can check out our representative transformation guides for your industry on www.sap.com/roadmaps. Was the guide useful to you? Let us know in the comments! you wrote: An easy way is to click ‘From customer profile’. 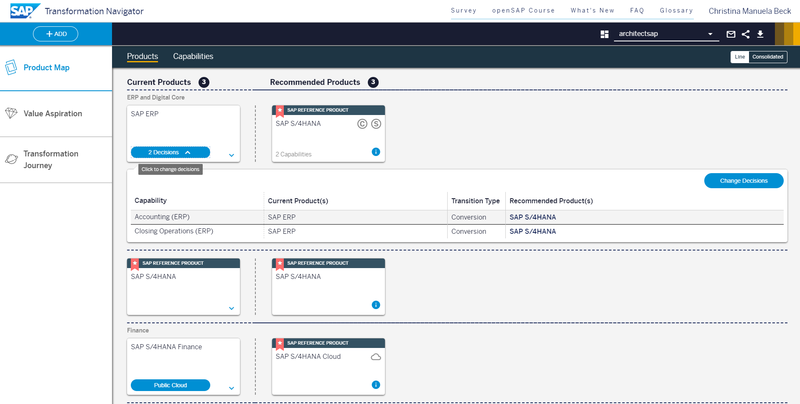 Your customer profile is linked to SAP Solution Manager, so all your products in the SAP Solution Manager will automatically show up in the SAP Transformation Navigator. my question: what do i have to do when the customer profile is not Linked to SAP Solution Manager, how can i Link the customer profile to the SAP Solution Manager? Your S-User is automatically linked to your customer profile in SAP Solution Manager. Please logon to SAP Transformation Navigator with your S-User and click “From customer profile”. If your systems don’t not show up, please send an email to saptransformationnavigator@sap.com ,and we will look into the issue. Of course you can also add products to your Product Map manually by selecting them form our product catalog (click on button “Browse”). Great post Maryia. Is there any way to have the capabilities prefilled based on system usage or UPL data?